Warner Home Video has now released a third DVD containing Peanuts shorts that aired on the cable channel Boomerang last year. Titled Peanuts by Schulz: School Days, the 2-disc set includes 29 more of the shorts, with a total runtime of 3 hours 27 minutes. Between this and the previous two DVD sets (Peanuts by Schulz: Snoopy Tales and Peanuts By Schulz: Go Team Go), 80 of the 104 Boomerang shorts are now available on DVD. 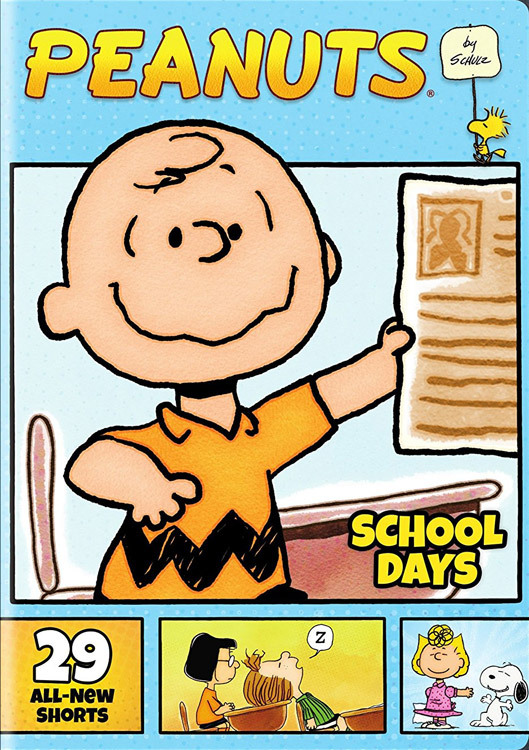 Peanuts By Schulz: School Days was released on August 29, 2017, has a suggested retail price of $18.94, and can be ordered now from on-line retailers such as Amazon.com, Walmart.com, or Target.com. Looking further ahead, on October 10, Warner will be releasing a 4K Ultra HD version of the Peanuts Holiday Collection with 9 specials on 4K Ultra HD and Blu-ray discs. It will be the first high-definition home video release for three of those specials. Look for more details in future blog post.